This is the best moment in the whole film. 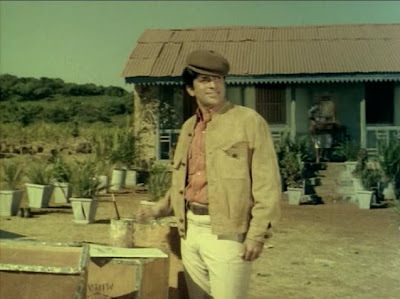 Except that, tragically, Shashi does not look as much like Shashi as he does in many finer moments in other movies (hence the comparison in the first place!). How can such a thing happen? I don't know, but there you have it. Seriously. Why? It's so enh. The bratty-disolves-to-lurve romance is cute enough, and there are other typical dramatic elements in place - fires, lost family members, adoptions, inheritances, blindness, evil bandits - that should all add up to a perfectly workable movie. But they don't. It's just...blah. She's bratty and loud and takes every opportunity to show off her dancing skills. As she should, as a 60s heroine. Plus she gets to be drunk while wearing a large metal fish on her head! What's not to love! Asha works her facial expressions and voice like crazy; she's very physical in the role, with whole-body pouts and winks. You could probably critique it as being cartoony, but I enjoyed it anyway. 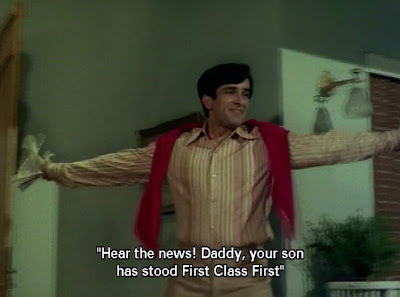 I'd like to say I was fond of the hero, Shashi Kapoor's Sunil/Sundar/Pyarelal/lord he has a lot of identities in this movie (I'll call him Sunil in the rest of the post to avoid confusion), but I wasn't particularly. yelling at his adoptive parents that they were selfish to have taken him in when they found him as a toddler abandoned by a temple. Ingrate! Unless I missed a scene, the film does not have Sunil and the people who raised him reconcile, either, abandoning them entirely in favor of his biological parents. There are a few moments, like this one, when I thought Sunil's lines and Shashi's performance are overdone - and not at all in the easy-breezy character in the first part of the story. Shashi...disappoints. Sigh. It was bound to happen sooner or later. 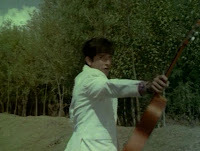 He doesn't have the most interesting role to work with, but I don't think he does much with it other than prance around with a guitar - itself a fine tactic, but it does not a movie make. The character and the performance are unengaging. Nirupa Roy does her usual ma thing. Here she is before the dramatic trauma (or should that be traumatic drama?) and after, with an added layer of krazzy4. The comic relief guys - a Lucknow poet and his secretary, who says the same catchphrase over and over - are soooo annoying. Fast-forward past them with all due speed. The poet has foot-long flowers attached to the end of his shoes. There are a bunch of other people running around - friends and relations (almost everyone is related in some way or other, even the bad guys) - but all you really need to know is that they either tangle up the threads of misinformation and misidentification or they help tease them apart and lead Seema and Sunil, and Sunil and his history, to togetherness. It doesn't even end satisfactorily. It's one of those stories that just stops. There's a big fight, then a dozen of the side characters come running up to the scene - all in a line, no less - and then the film cuts to this. As usual, PPCC sums it up well: the whole movie sits awkwardly and is oddly dull, like Sunil's unbuiquitous blah brown hat. In addition to Asha Parekh, the other bright spot, and an exceptional one at that, is R. D. Burman's music and its picturizations. The film's signature tune, "Tum Bin Jaoon Kahan," which we hear three different times, didn't move me, but I loved "Aap Se Miliye," in which Seema performs a dance about various bad boyfriends**, including Sunil! The different relationships have different settings, including the mountainside picnic where she and Sunil first meet, a Mughal palace (not pictured), Egypt (with many mini pyarmids and sphinxes), a Spanish courtyard (hence the toredaor and flamenco getups), and...well, I guess it's the wild west, since she's dressed as a pink cowgirl, but there's also a windmill, which confused me. In the last scene, she takes her pistol and picks off all the bad boyfriends one by one until the last one falls at her feet in remorse. It's really cute. 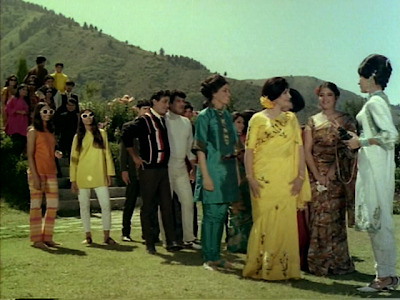 In "Aap Chahe Mujhko," Sunil pretends to flirt with a very tacky blond dancer to make Seema jealous (as you do). She never speaks - she just shimmies. Seema and her friends storm into the cabaret in matching costumes (she's in the fish barrette and silver fish-emblazoned red skirt) (as you do) and interrupt her with a full choreographed song (as you do), turning everyone's attention back to Seema, where it belongs. I don't know what this song was about, but it comes off as sassy and "I'm better than she is! You're stupid not to choose me!" (A proto "Hey! You! I don't like your girlfriend! ", perhaps?) Next, Seema is slipped a mickey and almost raped by a guy she meets at the cabaret, Sunil saves the day, and then she (oh okay, Lata Mangeshkar) slur-sings another cute song ("Main Na Miloongi"), lurching and grooving around as Sunil rolls his eyes at her escapades. Then there's "Che Khush Nazare," i.e. "The Gypsy Song." (You can see him do that goofy back-and-forth kicking move that the Boogie Woogie look-alike parodies in the previous post!) There's a silly backstory about how Sunil's dad once showed up at this same house and sang with the gypsies and won his mother's heart, so Sunil resolves to do the same with Seema and sings with the gypsies too. And no, there is no particular reason for the story to have gypsies. They do show up again later in the movie to help out in a fight, but they could have been farmers or townspeople or whatever. However, what they lack in reasonable exposition they make up for in costumes and musical stylings, so I'm definitely pro their inclusion. You'd think - or I thought, at least - that a late 60s movie, no matter how uninteresting, would be saved by mega Shashi screentime. Oodles of yummy Shashi! But nahiiiin! it is not to be in Pyar Ka Mausam. Frankly, he is not styled to ultimate potential. See the bleh hair? Too poofy and unmoving. Not Manoj Kumar poofy, but still. Does not live up to expectations. Suit jacket=good. Cravat=potentially good. This particular combo=Thurston Howell. Update to post (November 11, 2008): alert reader Temple has described Shashi's look in this film as "Masala Mister Bean." Perfect. Still, the Shashi Pradesh Ministry of Culture, Department of Outreach and Public Relations, requires that I share whatever Shashilicousness I can find, so here it is. I very rarely find brooding attractive, but Shashi has made it so. The hills are aliiiive with the sounds of Shaaashi (la lalala)! The scenery in this movie is a definite plus. Fake-pretend baby Shashi is cute too. The other things I liked about this movie are mostly inconsequential and irrelevant, but I'll include them just for proof that the movie is not full-on unpleasant - just unsuccessful at the more important goals of movie-ness. Pale pink sari with matching lipstick and hair flowers=do. Green polka dots with green stripes and capris=do. Love the orange pants and big white sunglasses. As PPCC pointed out, the self-referential humor is delightful (see top image). Trying to woo Seema, Sunil says he needs to tell her something important and takes her hands. She asks why he had to grab her hands, and he explains that that's how it's done in the movies. Yeah you have! Done by smoothies like Shashi! As previously mentioned, I find the "oo" in "Shashi Kapoor" very satisfying to say - Shashi should have "ooooh" in his name, in some sort of beneficent tautologicial propriety - and I appreciate it being emphasized. Or maybe the cirlces overlapping are just a reminder that this is a story about love and (re)union. Second, as Sunil sings to Seema in a garden adorned with Greco-ish statues (as you do), we get a nice parallel of posterior drapery. It'd be better if he were making the OK sign next to one of their rears, like in "Tumse Milke Dilka Jo Haal," but it's not that kind of song. Ugh, all that, and I haven't even answered my own initial question. To close, I don't know why this movie didn't engage me. I even watched it twice, popping it back in the DVD player when I realized I couldn't think of anything to say about it after my initial viewing. To be fair, that was with Antarra, who is very funny and very encouraging of Shashi-related/inspired tangents, and we were chatting a lot, so I missed a few things. But that's why I knew I needed to watch it again! I can't in all honesty say it's EPIC FAIL or anything, but it just didn't add up to anything special for me, and you can find better iterations of any of its good qualities elsewhere. * Someday I'm going to get someone to do my hair and makeup like this so I can properly test out what it's like to be a 60s movie heroine. ** The songs on this DVD weren't subtitled, so I'm guessing at the nuances of their content. ***OMG Is Saif supposed to be SHASHI in that song? That would be so great! Post-modern movie pyaar overload! I'd love that fish-clip, don't know where I'd put it though. It needs a bouffant and masses of hair. The windmill? Maybe a reference to one of the most favourite locations in Hindi movies, Amsterdam? Were there some tulips too? I'd love it too! I think we need to have a slumber party where we give each other bouffants and raid the wardrobe departments in search of accessories. ohhh beth, I adore this movie! It's soooooo 60's and I guess when I'm 18 on wednesday i might calm my love of the 60's down to a more mature fangirly level! But I love it coz its sooo convoluted and maybe deserves to be in the "Convoluted and Backwass Masala State" of the Masala Pradesh, but I love it when Nirupa goes all Krazzy, and Asha, I can't not love a movie where she's featured no matter how brutal and boring the movie is! I always wonder what the Bollywood fascination it is with blonde girls, couldn't he make her jealous with a curly haired black haired girl (ahem like me) or a brunette even! grrrrr 1960's fascination with blondes who make Indians jealous! Hi Beth - sadly I do agree that Shashi's character was not as loveable as he seemed to think he was. In fact I do think my friends and I may have used the word "tool" more than once. And this is Masala Mister Bean Shashi with his weird immovable hair and highpants. 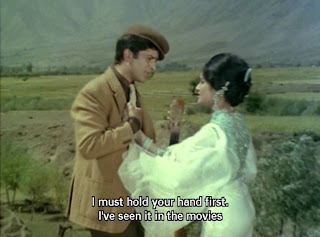 What I did love - the girls outfits, the sing-off (Pyar Ka Mausam and Shashi trying to lure the girls who were not really harvesting anything), the subtitles - my copy was v dodgy. Two of my favourites - one where Shashi is told to go "back to your gecko, Miss Loveleena" Loveleena being the blonde (but not a gecko as far as I could tell). And the immortal line "He can't come today - he has diahorrea", not a thing I would be divulging in a note to my love interest, but maybe thats why I am me and not a Bolly heroine. I got it on a double DVD with Pyaar Kiye Ja so still not a bad investment. But a bit too smarmy for love. Fun write-up. Here's a piece of trivia for you: the role of the Lucknow poet's secretary (the guy in the red hat) was actually played by R.D.Burman. Rum - There is no need to calm 60s-related excitement. I myself squeal with abandon at most things Beatles-related, Emma Peel, and Pyar Kiye Jaa. I agree the plot is really convoluted, which is why I didn't bother trying to explain it. Antarra had to keep reminding me who everyone was when we watched, and even when I watched a second time I was unclear. Good point about blonds. As a brown-haired girl, I will never understand, especially because at least half of the very blond blonds out there are fake (and probably have very crunchy hair because of it). Temple - Yeah! That's exactly it. I wish I could have had you and yours as company to yell with. And the subtitles, whoo boy! Those are good ones - mine had those too. Is "gecko" particularly insulting in India, I wonder? She does sort of look a funny color, but so does everyone in this aqua-tinged print. Personally I thought she more closely resembled a blow-up doll, since she mainly shook around with her mouth open but not saying anything. Ew. Surely most heroines do not mention such unmentionables as their gastrointestinal state? Gasp! Pinke V! Long time no see! That is excellent trivia - now that you point it out, I can totally see it. The gecko reference is Asha calling Shashi's blonde gf chhipkali - lizard. Gecko is "any of various usually small tropical and subtropical lizards of the family Gekkonidae" - a more specific term than lizard. Great trivia Pinke_v. I never noticed it on my several re-watches but can totally see it now! I saw this....but don't remember anything about it except that I liked the music. Must have been bland. Or maybe it was one of those evenings where I was overserved. I don't know. 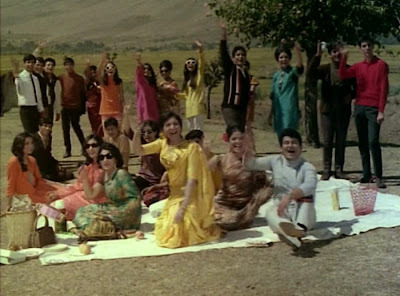 bollyviewer - Song indoctrination could easily be enough to tip in favor of this, I think. It's not so horrible - it's just not so great. Any idea why blondie is called a lizard? Because she is cold-blooded and scaly and therefore unfit for Shashi's company :) ? ajnabi - Do not seek it out. If you happen across it, fine, but I (and anyone here) can give you dozens of more entertaining recommendations. The fact that I do not find Shashi to be in his full (or even halfway) Shashilicious glory here is a damper on my assessment, to be sure. This movie does not, for me, have the "at least he looks good" bottom line. 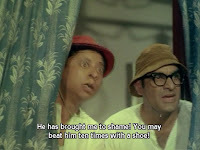 omg omg- that's RD Burman with Rajendranath playing the comic relief! :D I have to see this, specifically because I love RD insanely. He also had a bit part in Bhoot Bangla, which I love. That 2nd pic of Shashi's- can totally see reflections of Karan Kapoor in there- adorable- was reminded of him by Rum's latest post. You've got it! The blonde is too cold-blooded for Shashi! ;-) Seriously though, lizards are pretty ugly and I think thats what Asha is implying when she calls the blondie a lizard/gecko. I recollect friends telling me that this is actually an early 70s movie not the 60s. That aside, i think this movie is more famous for its songs. Pity your DVD did not have subtiltes for the songs. I thought u wud like this movie coz it had all masala elements and a young sashi. I guess some movies just don't work - period. Cheer up, the next Sashi movie you watch maybe more enjoyable! Oops forgot to add - pls do see "Aap Beeti" - must be 70s movie not sure- Shashi and Hema Malini movie - I think it is a kind of family drama but with a sassy Hema working as a sales girl in a shoe shop! Since you talked about "Tum bin jaoon kahan", have you seen a movie called "Dil Vil Pyar Vyar"? Not a spectacular one, but it has "remixed" R D Burman songs in it. Not the "add a dancing beat" remix, but good kind of remix. BTW, "Plonk"? That was hilarious. thanks all for the gecko clarification! Beth I do agree that a key word to describe Loveleena could be "inflatable". 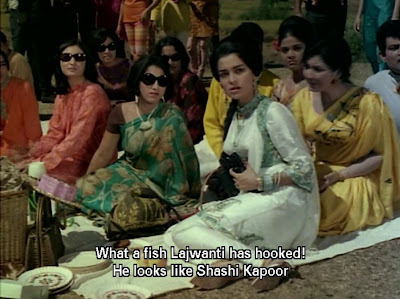 I too wish this film was better than it is, specially with Shashi and Asha (two of my favorite peoples in btown). Beth, I will read the post now but wanted to let you know there's a Shashi related comment at IndieQuill that I wanted you to read and share your knowledge. Thank you in advance. I can't help with the initial question either. It isn't even a bad movie, just bland, quite pleasant to watch and with some nice songs as well as a large number of relatives. Maybe part of the problem is that there is too much story crammed into the movie, and too many unresolved issues at the end, like Sunil's adoptive parents. that secy was RD!!! Lord Almighty! !